Local School Celebrates MLK Day with Community Service; Volunteers gave the gift of helping hands in honor of the holiday at George Washington Carver Middle School. 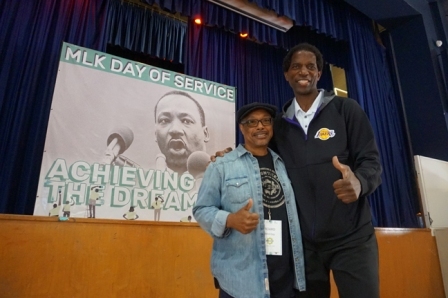 Martin Luther King, Jr. Day is not just a holiday but a day of service and that’s exactly what it was at George Washington Carver Middle School this year. On Monday, January 21, L.A. Works, LAUSD, Partnership for LA Schools, and Education Trust organized a large-scale volunteer service project, where more than 1,000 volunteers from diverse backgrounds came together to beautify the campus and surrounding neighborhood with painting, building, landscaping, gardening, cleaning, and assembly projects in observance of the MLK Day of Service. Supporters included Los Angeles Mayor Eric Garcetti, Los Angeles City Council members Joe Buscaino, David Ryu, Bob Blumenfield, Herb Wesson, and Mitch O'Farrell. The Los Angeles Lakers notable legend, 3-time NBA Champion A.C. “Iron Man” Green and the Laker Girls. Additionally, Anthony Chavez, grandson of Cesar Chavez, was scheduled to participate. On MLK Day 2019, L.A. Works brings the spotlight to the achievement gap in Los Angeles. Carver Middle School is located in South Los Angeles and on average, only 7% of incoming sixth grade students read at grade level. Many of the barriers faced by the students have to do with lack of resources, as well as homelessness, foster housing and access to food. Beautiful and clean facilities push students in the right direction by giving them an uplifting, positive space to work and grow in. They come into school reminded that someone took the time to take care of a place they call home for eight or more hours of the day. “We’re honoring the legacy of Martin Luther King whose message of social equality, economic justice, community resonates particularly in a time of divisiveness in or country,” said Bob L. Johnson, co-founder and board chair of L.A. Works. “It’s an honor, the holiday in which we celebrate, MLK Day, to be at historical, Carver Middle school,” said Green. “When you think about it, the history of both gentlemen and the significance of the future they had a glimpse of but never had a chance to walk into. 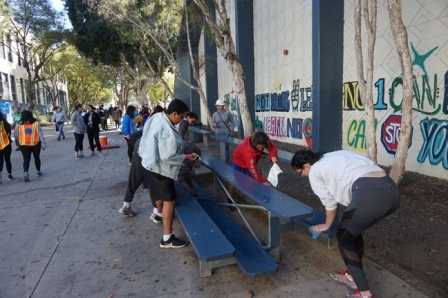 Volunteers spent several hours touching up paint, cleaning, picking up trash and other duties on and around the campus. Afterwards, Data Equity Walk shared statistics about the achievement gap and table-top Beyond Beautification projects highlighting 15 nonprofit partners providing additional services to the Carver students. In 2019, L.A. Works celebrates 27 years mobilizing Angelenos in the pursuit of a more equitable Los Angeles. L.A. Works @ LAworks.com maintains a calendar of monthly signature projects run by trained L.A. Works leaders; curates a database of longer-term programs and skilled volunteering such as providing interpretation services for immigrants or grant writing for nonprofits; and organizes thousands of volunteers for single day service projects. In addition, L.A. Works provides a turn key business solution for corporations engaging in community service projects. In 1994, Congress designated the Martin Luther King Jr. Federal Holiday as a national day of service. Each year, on the third Monday in January, MLK Day of Service is observed as a "day on, not a day off." MLK Day of Service is intended to empower individuals, strengthen communities, bridge barriers, create solutions to social problems, and move us closer to Dr. King's vision of a "Beloved Community." Principal Buck mentioned the teacher’s strike, which is going into its second week. She shared that she supports teachers and the efforts put into the MLK Day of Service.